This vacation rental cabin is a great winter getaway retreat with lake ice fishing, cross-country skiing, back-country skiing, snowshoeing, snowmobiling, and winter ATV riding nearby. 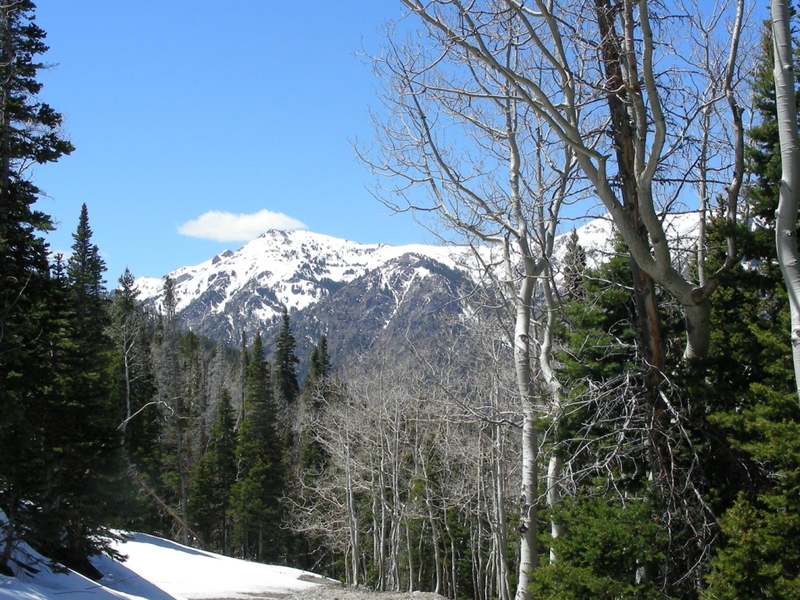 It is located at the foot of the spectacular 12000+ Tushar Mountains of central and southern Utah. This deluxe cabin is beautifully furnished and is situated in Bullion Canyon by beautiful Pine Creek with spectacular views of the Tushar Mountains to the west and the Monroe Range to the East. The Bullion Canyon Road to the retreat is snow plowed after each storm. We plow the driveways in the retreat. This large and comfortable cabin features separate satellite televisions in the master bedroom and living room, two large bathrooms, full quality audio system, leather furniture, beautiful art pictures, two view decks, hot tub sauna, private washer and dryer, soap, towels, dishes including wine glasses, silverware, full deluxe kitchen with all the appliances such as toaster, coffee maker, mixer, pancake grill, outdoor grill, etc. If this cabin doesn’t have it, you don’t need it. There are two excellent, well-known year-round restaurants nearby called the Big Rock Candy Mountain Restaurant and Hoover’s Cafe for your breakfast, lunch, and dining convenience. Richfield Utah is about a 35 minute drive away that features many good restaurants as well as department store shopping. The cabin has 2 pairs of snowshoes for your use. Rarely 4 wheel or snow tires may be needed to get out of a parking place or parking situation when there is ice or new snow at the retreat. In general, we do recommend that you have a winter equipped vehicle to travel through out south-central Utah in winter. Don’t worry if you don’t have 4-wheel drive, we’ll be glad to hook onto you with our jeep and get you out. This cabin is a great solution for a group that wants to spend some time ice fishing at Fish Lake, Otter Creek, or Piute Reservoirs. The National Parks are spectacular during the winter months and within day trip distance from the retreat. 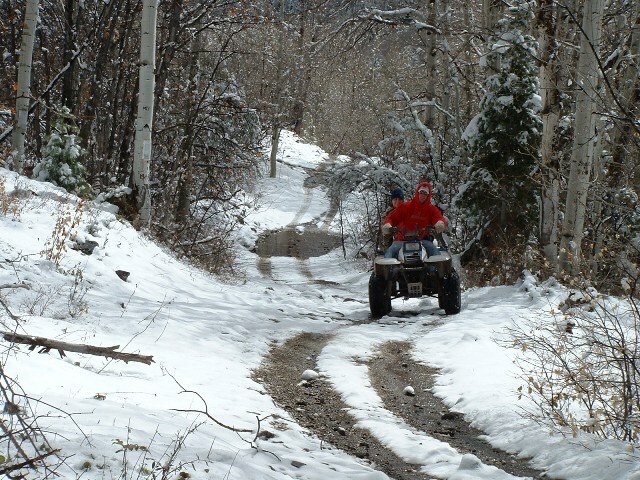 Disclaimer— ATV riding and winter sports in general in the Utah backcountry is dangerous by nature and could result in property damage, injury or death. If you ride, ski, or walk these trails, you acknowledge this danger and assume full responsibility. You are the final judge as to whether a trail is safe on any given day and whether your skills and equipment capabilities are adequate for a safe trip in these mountains. Your Comments or Questions ? -> Large, newer cabin new quality furniture, western décor and all the amenities on 8 private acres. No crowds to deal with at this retreat. -> Private and secluded away from town up the canyon yet conveniently close to get supplies or eat out. It is situated in a beautiful mid-elevation riparian habitat of ponderosa pines, cottonwoods and meadows with fantastic open views of the mountains to East and the West. The Fish Lake National Forest is nearby. -> Many wild animals right around the cabin including chipmunks, squirrels, hummingbirds, native songbirds, trout, mule deer, wild turkeys, and feral peacocks. -> Beautiful wildflower rock gardens. -> Complete playground with tether-ball, foosball, horseshoes, beautiful creek, meadows, and secluded meadows. Kids can ride bicycles on our private loop road without worry. -> It is only a few yards from the Bullion Creekside Retreat gate to the main trail to Bullion Canyon Falls and direct access to the Paiute ATV Trail and all its spur trails that you can ride to without trailering. In 4 minutes on your ATV you can be in the prime riding trails west of Marysvale in Bullion Canyon of Gold. -> Jacuzzi hot tub and outdoor eating area large enough to congregate your friends for a barbeque, etc. -> Two large view decks with afternoon and morning shade. Tremendous views of the Tushars to the West and Monroe Mountains to the East. -> Knowledgeable, friendly outdoors-loving hosts that live on-site that regularly ride all the trails in the area who will treat you like visiting friends. We can advise on all your outdoor activities, including trail knowledge and fishing. -> Internet access available via wireless network or via our computer in our office. -> Free equipment to loan for local excursions. This includes day packs, full-size backpacks, fishing poles, and snowshoes. -> Many locations around the valley have poor or no cell phone reception, however most cell phones get 2 or 3 bars from our cabin deck . See Winter Fun Videos in Bullion Canyon ! ATV Plow gets Stuck ! Ladies go for it ! Some of the action in these videos are beyond sanity and we don’t necessarily believe anybody should do these things ever...if you choose then only at your own risk ! First of all we want to thank you for your hospitality. Your place is beautiful and both of you are wonderful people. We came to Utah for the first time this year and will definitely be back—to stay with you. Excellent accommodations and wonderful recommendations for trail riding. We ride every year in Colorado and we were all challenged this trip on the Paiute Trail. We all smile the whole way. I am an internet junkie and will give you an awesome review on Trip Advisor. Great meeting you both ! Keep up the good work ! Your place is awesome ! Thank you again from San Angelo, Texas.